Mobile cranes are amazing things. Without them the UK construction industry would be a nightmare at best. 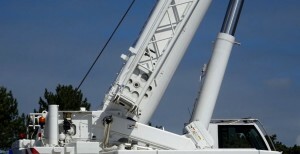 But when you need to hire a crane and still pay for the goods to get to site it soon adds up and the lifting operation suddenly places a rather large dent in your budget. So the question we are asking is…. 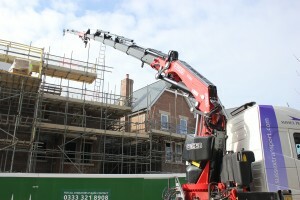 Why hire and large mobile crane and transport when Sussex transport can do it all in one go ! We were recently approached by a new client who wanted someone to solve there lifting / delivery problem with a skilled, safe and efficient lifting operation and on a strict budget. The site located near Woking in Surrey, with tight access, required the delivery of over 12 ton of varied steel work. This included a 15.5 metre long beam. 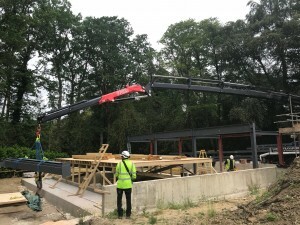 Our artic unit which extended its trailer to accommodate the long pieces of steelwork was skilfully reversed into position allowing the driver to then set the crane / fly jib combination to work at an impressive 25 metres radius. 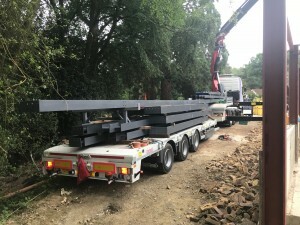 As with many sites there are items in the way and it just so happened that this time, each piece of steel work needed to be lifted into position right over a newly constructed swimming pool. The 2 day lifting operation was successfully completed with the client looking to utilise this machine on future work. This entry was posted in Delivering to..., News, Surrey Road Haulage, Where are Sussex Transport going..., Where are Sussex Transport..., Working with.... Bookmark the permalink.